We’re finally learning more about Hyundai’s next-generation Genesis Coupe. The Korean Car Blog is reporting that a prototype of the new model was spotted with a label that read, “3.3T 8AT AWD.” Of course, that translates to a 3.3-liter turbocharged engine paired to an eight-speed automatic with an all-wheel drive setup. From the amount of displacement, it’s a good bet the new engine is a twin-turbocharged V6, which lines up with previous rumors of such a mill producing up to 480 horsepower. Hyundai may have cut out the 2.0-liter turbocharged four-cylinder from the 2015 model year Genesis Coupe, but it will reportedly return for the 2017 model year Genesis, retuned for more power. Also on the docket is the current naturally-aspirated V6. The twin-turbocharged V6 will be the range-topping powerplant of the N performance variant. We can also expect bigger brakes, a sport suspension, and unique bodywork to accompany the “N Performance” badge. 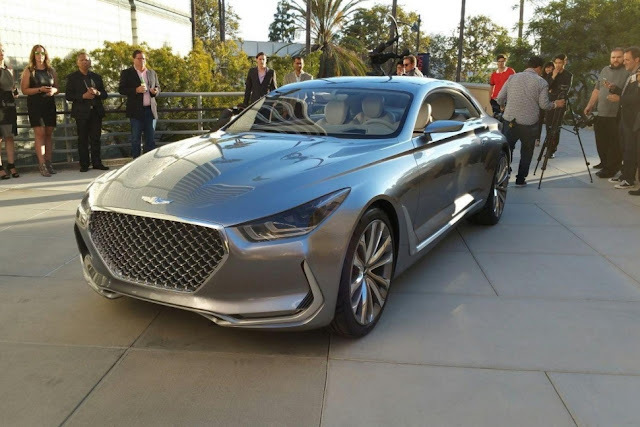 In terms of styling, the Genesis Coupe should debut with a hybrid of the redesigned Genesis sedan and Vision G Coupe Concept’s styling cues. If the production vehicle looks anything like the Vision G Concept, then we’re in for one attractive sports car. “The design is our interpretation of the idea that Hyundai breathes into all of its vehicles — a DNA that balances design and performance with the idea that you don’t need to be over the top in terms of glitz and stereotypical luxury cues,” said Peter Schreyer, Hyundai’s president and chief design officer, in a press release. With 480 hp on tap, the N Performance Genesis Coupe should also offer far more than good looks. If the chassis and suspension tuning match its power, the range-topping model could rival the BMW M4, Mercedes-Benz C63 AMG Coupe, and Lexus RC-F.